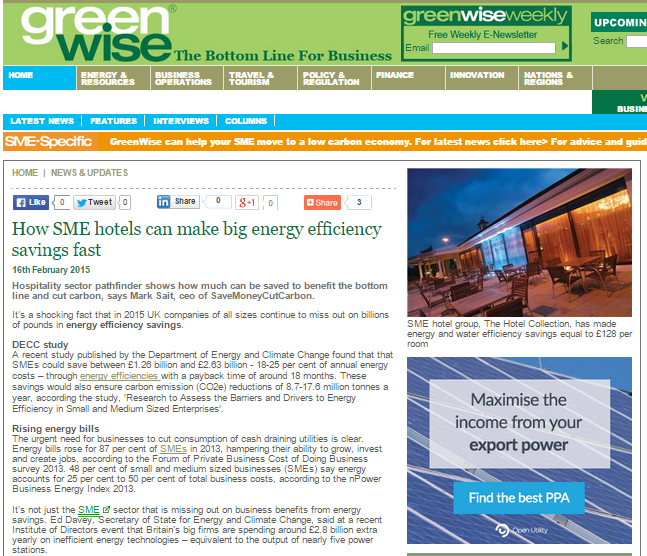 Mark Sait, CEO of SaveMoneyCutCarbon is featured in a hotel energy savings article published by Greenwise Business portal. Mark advises: “We know that many simple measures can add up to millions in savings, focusing first on the most effective steps like LED lighting, heating and ventilation controls and water efficiencies using eco taps and eco showers. “We’ve seen dramatic results from our work in the hospitality sector. Industry leaders like Paul Nisbett, finance community chair of HOSPA (the Hospitality Professionals Association for Finance, Revenue Management and IT) advise that hotels can save millions of pounds by taking simple measures to save water and energy which pay for themselves within two years.